Boy, they didn’t know what was coming. 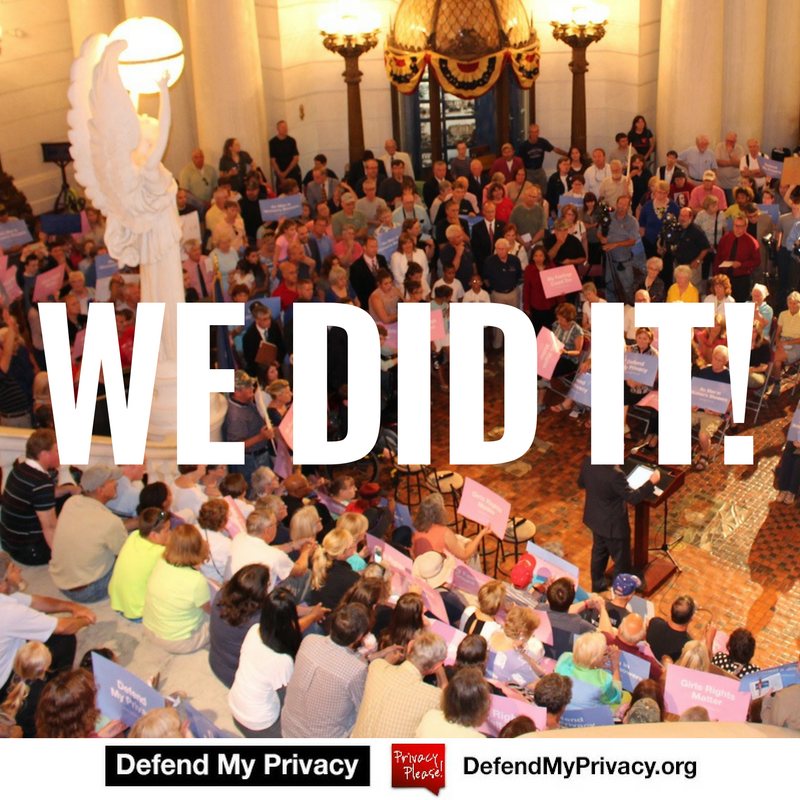 Launched last April, Defend My Privacy Coalition teamed up with you and thousands of Pennsylvanians – moms and dads, teachers and students, grandparents and concerned individuals – to give voice to the importance of personal privacy and safety rights threatened by this legislation. And your voice was heard. Those pushing the legislation were relentless, scrambling to break the legislation into smaller bills in the Senate and trying an end-around passage in the House. But after you joined us in making waves of phone calls, emails and visits with elected officials and helped make the largest rally of the 2015-2016 legislative session happen, Governor Wolf’s Bathroom Bills for this session have been defeated! I know we’ve asked a lot of you over the last year but would you please take an additional action step: please take a minute to sign this Thank You e-Card to your elected officials. It’s a way to remind them of how important this issue is to you – to all of us – and to encourage their support for privacy rights in the future. To everyone who contacted their State Senator and State Representative about these bills – whether by picking up a phone, sending emails or stopping in their office – it makes a difference. We would not have had such a successful effort had it not been for your involvement. So be encouraged and remember this fact as we head into 2017. We know the fight continues. We know heavily-financed, powerful groups pushing this legislation will continue. But if we can count on your involvement, Defend My Privacy Coalition will continue to advocate for the protection of privacy rights and the safety of everyone in Pennsylvania. Click here to sign up for Defend My Privacy email alerts. Follow Defend My Privacy on Facebook and Twitter. Thank you for protecting my daughter and I! Thank you Representative Steve Barrar for your support for defending the privacy of our citizens. Thank you for standing firm for our daughters and granddaughters. We are so very grateful to you all for spreading God’s Truth in a dark world and standing for freedom. May our Great God bless you and your families as you live to serve Him! Thank you for all your hard work to defeat this bill. thank you for not passing the bath room bill god bless all who are standing up for our rights of our dear little girls and woman. God is good, thank you everyone for your hard work!